The final push to restarting my overnight adventures comes in the way of a new bike. I say new, it's now covered over 1,200km so I've had a chance to get used to it round my local trails. I thought it might be worth explaining what it is - and why I've arrived at this particular design. In previous posts I've told of my fatbike and where I've been with it. Truly a revelation, the fat tyres and frame have shone on "proper" fatbike terrain like snow and ice but have also shown their capability on other, more common, conditions where the amazing traction and wide floatation transform what's possible on a bicycle. However, it's impossible to deny that there is a weight and drag penalty in many other conditions. I was therefore intrigued when Surly launched the Krampus. 3" tyre width promised to be a good compromise between fat and non-fat tyres. Unfortunately, with me being 5'7" the Krampus was never going to be suitable as a bikepacking platform - wee legs and tall wheels rule out many luggage hauling options. My previous decision to buy a custom Burls Ti 29er for bikepacking was looking pretty astute until WTB came along with 27.5+ or 650B+, whatever you like to call it. Here was the 3" tyre option for those of us shorter in leg. Of course, as a new "standard" there was the question of how widespread it would be adopted but being the impatient sort, I immediately set about seeing how I could obtain it. Initial investigations showed that, despite the suggestion B+ might fit in many existing 29er frames, my Burls was not amongst them. The chainstays were simply too narrow to permit anything larger than a 2.4" tyre. Shame - the frame was otherwise ideal and the cost of converting it was simply going to be too great. The next option to consider was too look at what was on sale. At this time, there wasn't much and, having gone the custom route already, I felt willing to do so again to get just exactly what I wanted without having to compromise on details. Step up Brant Richards and Pact Bikes. Brant was offering to work with buyers to help them arrive at a good solution to their requirements without them having to know all the intricate details. This was ideal. I'd fire over some geometry, Brant would model it and together we worked out how to fit everything I wanted into something that could be manufactured. It's a good system. Too many times I'll look at a bike (or frame, or something not bike related at all) and it won't be just what I want, requiring some compromise or other. And with a bike designer in the loop between me and manufacturer, I was a lot less likely to end up with something that handled like a dog or had some other strange characteristic. Clearance for a 3.5" tyre. A range of B+ tyres was only just becoming and I wanted to keep all options open. The ability to use a front derailleur (new Shimano side-swing). I still much prefer 2x gear systems to give me a range for uphill-loaded cycling and faster "road" transitions. The side-swing style creates extra clearance between the downtube and the fat tyre, though it requires a different cable routing. Boost rear axle. This longer axle provides a suitable chainline for the wider tyres. As a "bolt-through" 12mm style it also creates a stiffer rear end, something I'd experienced on other bikes and appreciated. Aimed at 100mm travel forks. I wanted the option of fitting rigid forks and these mostly come with axle-to-crown lengths to match a 100mm travel suspension fork. I also reckoned 100mm of travel was more than enough for the use of the bike. 31.6mm seat tube with "stealth" cable routing for a dropper post. This was way down the list of my requirements but seemed to offer a "something for nothing" option. No rack mounts. THis was a bit of a departure for me. Previous frames always had these and I'd specified them for my Burls. However, I never used them and have adapted to the soft luggage options completely now. 100mm head tube. I wanted to keep this short as I knew the taller wheel would result in quite a high bar position anyway. Small BB drop. A bit of careful juggling with numbers indicated that retaining a slightly higher BB would sit me slightly higher, increasing the space between saddle and tyre and reducing the possibility of the tyre rubbing on the bottom of a fully-loaded seatpack. Three sets of bottle cage mounts. Two are internal to the main triangle and the third is fitted below. This has the triple cage mount suitable for the likes of a Surly Anything Cage, providing an additional luggage carrying option. Other factors like stand-over height, bent downtube to ensure fork control clearance and tube shapes/sizes were arrived at between Brant and myself and, with a final check-over of all the numbers, the frame was ordered. made and delivered in a few weeks. With all of that coming together, I also had to consider some of the other components. Rims; The first proper B+ rim available was the WTB Scraper i45 rim. This promised a nice wide rim and tubeless compatibility at a reasonable weight. Hubs; Hope Pro2 Evo. I've used Pro2s extensively without issue and again there was little choice at this time. Tyres; My original tyre choice was the Panaracer FatBNimble 3.5" front and rear. Light weight and a tread pattern similar to my beloved 45Nth Husker Dus on my fatbike. Drive train; Shimano XT M8000 2 x11 for the gear range and suide-swing mech. Brakes; Shimano XT M8000 again. I've always liked the fell of Shimano brakes and these offered a simplified brake/shifter arrangement to reduce handlebar clutter. Forks; I found some rigid carbon forks through ebay that took a 15mmx110 Boost axle and had the correct A2C height. A bit of a long-shot but the only option I could find. Suspension forks are Boost Rebas. The only models available were 100mm travel with a bar-mounted lockout or 120mm travel with a crown lockout. The lockout isn't a feature I use a lot and I prefer not having that additional cable (bar clutter and bar bag mounting issues) so I opted for the 120mm to try out and reduce travel if necessary. So - what does it look like and how does it go? Initial impressions were favourable. Light, easy rolling, seeming to pick-up and carry momentum from nowhere, comfy and grippy. Everything I was looking for really. And then it got wet. Frankly, the front tyre became a liability. With a profile wider than a standard MTB tyre but not as wide as a 4" fat tyre, the front end would just skate across any thin mud and I'd lose control. Luckily, salvation was at hand. Unlike the 29+ tyre market, B+ was coming on stream really quickly and I bought a 3" Nobby Nic for the front. This made a huge difference to grip - and therefore confidence - without it feeling like I was getting a lot of tyre drag. I also fitted the Rebas to replace the rigid forks. I'd been happy with rigid on my fatbike, though as I explored its capabilities on a wider range of terrain, I'd come to understand how suspension and fat tyres might work. As an initial option, I just fitted them with 120mm travel (in theory more than the frame was designed for) and again it just seemed to feel "right" from the first ride. As a result, I've left them on. With a few more subtle changes, the bike now looks like this. Nice dropouts and the 12mm axle. It had to have a name! In summary, I'm really pleased with the frame - and the bike it has helped me create. Inevitably, there are a couple of minor tweaks I'd make if I was doing again, the most important being that I tend to clip both the chainstays and seatstays with my heels. This has been a problem with all my bikes and it's mainly because I pedal like a duck! Some things I've still to play around with are; a more extended test using Jones Loop bars, fitting and riding the 29er wheels I also built, fitting the rigid forks again, trying a different rear tyre, maybe even fitting a B+ front and 29er rear. And the name? Well, though I like the look of Titanium frames, I do think the bare metal needs something to break it up. I ordered some decals from RetroDecals and was looking for something in addition to the Pact logo. Brant had taken to giving some of his frames names like Fatcat and Battlecat. I thought Wildcat was appropriate given that Speyside is a home to the rare Scottish Wildcat and the frame had been conceived - and would be largely ridden - here. In days long past, the outdoor recreation community in Scotland would scoff at their poor cousins south of the border. "Look" we'd all say "they can only go on particular trails whereas we can go anywhere". Then some bright spark had the idea of creating the West Highland Way. "Oh no", came the cry "it'll result in walkers' (for it was mainly walkers) access being restricted and we'll be just like the English". In time, the WHW and its subsequent cousins, the Southern Upland Way, Great Glen Way and Speyside Way became an accepted part of the landscape and other Long Distance Paths (LDPs) have been springing up. One of the more recent creations is the Affric Kintail Way. Shorter than many of the others it does, nonetheless, represent a significant undertaking given that it passes through some of our most remote countryside. Casting around for a bit of inspiration to get back into bivvying and camping I considered that this might be an ideal candidate - especially once I added on a bit of riding at the start and end to make the logistics work. My plan was quite simple; head out on the Great Glen Way from Inverness to Drumnadrochit, meander over to Cannich, then head down Glen Affric for an early stop and a relaxing evening outside before heading through to Morvich the next day and riding up to Kyle of Lochalsh for the train home. The weather was looking great, the trails would be dry and I'd eventually get a chance to take the bike I'd designed just for this experience out to where it was meant to go (more on the bike in part 3). Not being in any particular rush, it was late morning by the time I headed out of "the office" in Inverness and onto the Great Glen Way. 8 degrees and misty wasn't what I'd expected but I was hoping things would improve. Having cycled down this section last year I was aware that there was a bit of a steep start and just ground my way up until the slopes levelled off and I was on to the moor at Blackfold. That's when I spotted the cyclist up ahead of me, bike on the ground and fiddling with her bag. 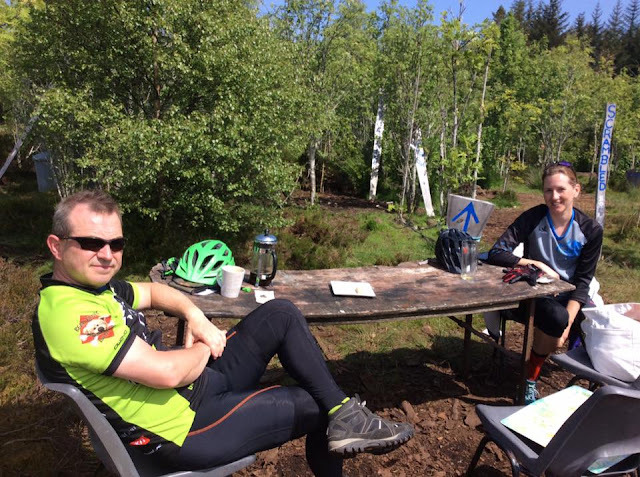 It turned out that this was one of our customers who'd just had a puncture so I helped her get it fixed (discovering that my pump wasn't working) and sent her on her way, only to catch up again later just before the wee Eco Cafe at Abriachan. Now, I've always meant to stop on here and as the sun broke out we both pulled in for what must be Scotlands finest al fresco eating experience. I could try to describe it to you but would no doubt fail to convey it properly. You'll just have to visit for yourself. Heading on, it wasn't long before I reached the more interesting forestry sections of the GGW high above Loch Ness. These undulate a bit but they are definitely better heading south than north! A speedy descent into Drumnadrochit marked the end of the "Prologue" so I stopped for some frozen yoghurt. I also noticed that the power LED on my SPOT tracker was flashing red, meaning low battery. A visit to the local shop only turned up Alkaline in AAA size but beggars can't be choosers and they were fitted whilst enjoying my froyo. Wandering over to the Tourist Information Centre, I had a look around to see if they had any maps or guides to the Affric Kintail Way and found a lovely Harveys map of the whole route. One can never have too many maps so this was added to my pack. Whilst looking at the AKW information board, I was spotted by a hiker who'd just come through it and was concerned that I'd have a big push up the first section. I'd already spotted this on the OS map and was OK about it but we got talking about the route and my kit. As is often the case, he was astonished at how little space it was taking up and, after swapping kit details, we parted for me to head west. The map didn't lie. Not long after entering a pleasant bluebell woods it started to climb steeply and very loose, not helped by the dry weather. Just before the "big push"
With a longish day in prospect I decided to take it very easy and walk where most appropriate. Eventually, it flattened out enough and I started to make decent progress. As it turned out, despite having the route in my GPS, I found there were many more tracks around than indicated on the OS map and the Harveys version I'd bought was referred to constantly. At Corrimony, the AKW takes to the road for a few miles into Cannich. This includes a rather fast and long descent, which seemed such a shame on a mountain bike after having to suffer the climbs. I always like coming to Cannich. There's nothing particularly inspiring in and of the village itself but it does mean you're entering a stunning piece of countryside with Glen Affric, Tomich and Mullardoch all spinning off from here. It's a bit like your favourite TV show having a really naff theme tune. You might hate it but it gets you excited for what's to follow. On this particular afternoon, Cannich was hooching. There was some sort of mountain marathon event on and the place was full of campers and vans. Having plenty of time to spare, I decided I grab some food and went to the pub hoping it wouldn't be rammed with runners. I was in luck. It was rammed with drunken shinty fans instead! Still, I managed to grab a burger and chips before heading out of the village again. The AKW climbs steeply up the Mullardoch road, before heading off on more forest track. The height gained is pretty substantial so there are some decent views for a while before the forest encroaches once more. There follows a steep descent down to cross the road at the Dog Falls but there's a strange subterranean arch on the way down that I've yet to find the purpose of. Again, the track rises and I eventually reached the viewpoint looking out to the South West. It's stunning on a clearer day but even with the heat haze it's a fantastic place to sit and ponder for a while. Good place for a "pause"
Haze knocking back the visibility quite a bit! By now I was seeing the tyre tracks left by the HT550 participants (who would have been going the other way) and got to wondering what state they were in (mentally and physically) when they'd passed here a few days earlier. As already said above, my plan had been to stop early but by the time I reached Loch Affric I was on a bit of a high. The legs were spinning, there was still loads of light, I was well fed and watered and I was getting a real buzz from just crossing the country so smoothly and effortlessly. Like an addict separated from his choice of drug for too long I didn't want to say "enough", I just wanted it to go on like this forever. I was even thinking "I'm not stopping for photos" when I'd come round a corner and just have to slam on the brakes and get the camera out. The little oasis of Strawberry Cottage, just before the "big hills"
The far end of Loch Affric was passed, then Strawberry Cottage - looking well busy. Just after the fork in the track I saw two folk running towards me. We exchanged a few words; they were running from Morvich to the Glen Affric car park. I said they were even more mad than me but they were intrigued by the bike and that I was planning to stay out overnight. I left them to complete their final five miles and continued making my way along the bouldery, loose track. Five minutes later and two cyclists were approaching - pushing across the boulders gingerly. They'd been up Munro bagging, so we exchanged notes on gaelic pronunciation and they too were taken by how small my load was. The more so when the woman realised I wasn't even wearing a backpack of any sort. They were also fascinated by the big tyres and their ability to cross the rocks as they were struggling and had resorted to pushing. With a few minutes lost to chat, I was again on the move, making easy progress past Alltbeithe Youth Hostel. Alltbeithe YH. No driving to this one! Not long after, I passed another group out camping and then I had a decision to make. I reckoned there was still enough daylight to get me past Camban and down to Glen Lichd - and potentially Morvich - but then the plan had been to camp out somewhere remote. I swithered for a while, not wanting to waste the fine night and my great mood, but eventually gave in and selected a reasonably sheltered spot just off the track and not far from the river. Despite lack of recent practice it didn't take me long to get the tent up and my sleeping kit sorted out. I guess one advantage of having little kit is that choices are easy and it's hard to misplace anything. The ground was comfy, my pitch was well chosen and I eventually took the time to relax. It wasn't long before the cooling evening air saw me half-in/half-out the sleeping bag while I cooked up a little instant meal, which was eaten more out of a sense of duty than of hunger. I didn't even pop open the hipflask of whisky I'd brought along. It was a stunning evening though and as the stars started to show I reckoned it was late enough to zip up the midge net door of the tent and settle in for the night. It certainly didn't take me long to nod off, though I soon woke up feeling too warm and having to remove my jacket. I woke up a couple of times through the "night" too, not that it ever really got dark. I eventually decided to get up around 5 and, still not feeling hungry, skipped the porage option for a wee cereal bar and a splash of water. Out of interest I timed myself; 30 minutes from deciding to get up I was packed and on the move. Again - little kit, little faff. The sun from yesterday was now hidden above a layer of hill mist but I had high hopes it would clear as the day progressed. The path to Camban was a complete contrast to the easy forest track and even the bouldery stuff from Strawberry Cottage the evening before. This stuff was proper hard and rocky and made even more difficult by the fact I was climbing. Most of it was ridden - I'm pretty sure it would have made a fun descent - though the proportion of pushing was definitely increasing as the distance was covered. Past Camban bothy and the same story continued. What's more, it seemed that there were so many ups and downs. The hard geology here certainly belies the contours on the map so I was glad when the mist started to clear and I could make out both long stretches of track in front of me and the higher mountains. Amusingly, the river can be seen gradually running downhill on its way West but the path keeps climbing higher and higher above the river in apparent flouting of the norm. The reason for this becomes clear when a large gorge appears on the left, with the river now tumbling down an impressive waterfall through a gap in the cliffs. The path becomes quite vertiginous for a while, especially where it crosses a large landslip. Again, I was resorting to a large amount of pushing. I'm sure that with a different bike, unladen and with company, I'd have ridden more of it but I was happy here to jump off whenever things were looking a bit too gnarly. As it went on, I could find myself getting more and more frustrated but had to fight back the urge to be too reckless. The effect of this pushing was, however, that I was now running behind my planned schedule for catching the train in Kyle. By the time I reached the estate road at Glen Lichd House, I was beginning to have serious doubts I'd make it in time. Finally at valley level. A couple of nice new bridges here. Stripping off my jacket now that the mist had completely cleared I zoomed down the glen, scaring sheep off the track, fueled by large handfuls of chocolate peanuts and the last of yesterdays energy drink. Thing was, I hadn't booked my bike on train anyway so there was a chance I'd be racing up the road for no reason! As it turned out, I needn't have worried. I arrived with lots of time to spare and, after speaking to the driver, just loaded my bike onto the train before disappearing to Hectors Bothy for breakfast. My original intention had been to get a takeaway but I figured that the later I got back to the train, the less time there would be for the conductor to throw me off in favour of some pre-booked cyclists. Without overnight gear, and given two cars (or a willing driver) it could be completed in a day. It certainly has some full-on biking - especially the descent to Glen Lichd - some great, fast forest tracks and is always in amazing scenery. The best thing I can say about it is that I'd definitely do it again. Once again I feel a little explanation is necessary. It's be so long since I updated this blog and I've been giving some thought as to why. This whole blogging thing started when I stuck a couple of post-riding stories in the Singletrackworld forum. Prior to that I'd simply been taking wee notes as a personal reminder of some of my trips. They are fun to look back on and help re-live the thoughts that were going through my head at the time. The feedback from my posts was encouraging and I decided I'd blog a bit more so that a wider audience might enjoy them. Primarily though, it was still for the benefit of my future self. Of course, it was flattering to get some nice reactions and to think I was inspiring other folk to get out there too. However, as I've got more and more into reading other blogs and forums, I've come to realise that my wee adventures are actually quite pedestrian. There's no end of folk out there pushing boundaries and doing much more inventive and difficult trips. That got me to questioning not only the act of writing it down, but the "value" of doing the trips myself. It like; you might think it's an achievement climbing Ben Nevis but when someone is doing Everest, it causes you to have a bit of a re-think. Then, a couple of years ago, I decided I'd do the Highland Trail Race. It was working out OK for a while - the riding became all about "training" for the race and I was definitely at the level whereby the fitness was fine. Thing is, my head just wasn't in it - and so I pulled out. And we moved to Aviemore. Frankly, the riding around here is awesome and I've really struggled to find enough of an incentive to travel elsewhere to ride. Plus there's again that nagging self-doubt that simply being out and enjoying riding just isn't enough on its own. All of the above have somehow discouraged me from exploring and, therefore, from blogging about it. That's not to say I haven't been riding at all. My mileage over the past couple of years has been pretty steady and more of it tends to be off-road these days. However, I've now been prodded by a couple of folk, I've been inspired by the recent Highland Trail Race and I've managed to put together a wee bucket list of trips I intend to do - just for myself. I'm hoping this rekindling of spirit helps encourage and inspire some more folk too.